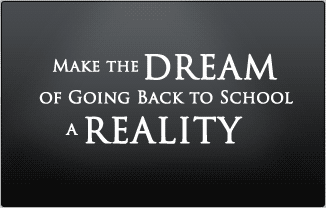 College IS Power: Make the Dream of Going Back to School a Reality! Find the right college for you. Use our free search to discover colleges that match your academic and career goals. Each year more than $143 billion is awarded in financial aid. With this much money being paid out, you definitely need to make sure that you get every penny that you deserve. Unfortunately, the biggest mistake that most adults make is not applying for financial aid because they assume that they won't qualify. Imagine sitting in the comfort of your living room in pajamas and slippers while participating in a classroom discussion of English literature. Seem impossible? Through distance learning, you can do exactly this.